The Y.O.G.A. for Youth mission is to provide youth with tools of self-discovery that foster hope, discipline and respect for themselves, others and their community. The Y.O.G.A. for Youth Teacher Training is one of the oldest and most distinguished training programs to provide mindfulness tools to young people. This non-profit program prepares you to deliver creative and dynamic classes to youth of diverse backgrounds with a massive impact. This is the first time this training will be offered in Vancouver! There are no pre-requisites and the training is for anyone working with youth from yoga teachers, parents, youth workers, and therapists to paediatricians, nurses, and school teachers. This program will be led by the acclaimed yoga activist and master teacher and trainer, Krishna Kaur, E-RYT! She is regarded as a master yoga instructor and has more than 20yrs of experience working with youth. This training will enhance your teaching ability and expand your knowledge of yoga across multiple disciplines. The main area of focus will be on developing tools that will assist you in translating ancient yogic principals into a language youth can understand and apply to their daily lives without diminishing its powerful effects. An emphasis will be placed on specialized programming for under-served, “at-risk” and traumatized youth populations. This training will not only introduce you to the policies and procedures of teaching in secured facilities, but it will also prepare you to effectively deliver creative and dynamic youth yoga classes to diverse populations with a massive impact. Elevate your teachings and set yourself apart from your fellow instructors through the Y.O.G.A. for Youth Teacher Training – a program scientifically proven to deliver “significant results” by Dr. Sat Bir Singh Khalsa at Harvard University. Krishna Kaur, a dynamic heart centered Yoga teacher, began studying with Yogi Bhajan in 1970 and has been teaching the art and science of Kundalini Yoga and Self Awareness for 40 years all over the world. She is certified by the 3HO Foundation and the Kundalini Research Institute as a Kundalini Yoga Teacher and Trainer of both Level I and II. 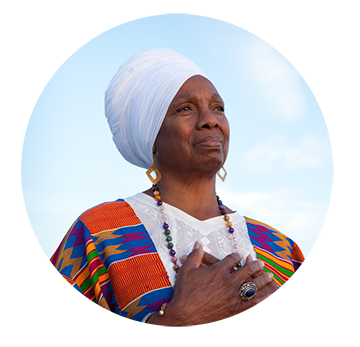 She is the regional coordinator for 3HO Africa, which unites Kundalini Yoga in Africa. Krishna founded Y.O.G.A. for Youth, a nonprofit dedicated to training yoga teachers to work with at-risk youth and creating yoga programs in schools and juvenile facilities. Krishna opened the first yoga center in South Central Los Angeles in 1971 and continues to train yoga teachers, teach workshops, and bring yoga to the underserved populations throughout the world. A catalyst of many yoga-inspired movements including the International Association of Black Yoga Teachers and Sat Nam Street Players, Krishna has many commendations from local and state leaders. Krishna has a bachelor’s degree in business from the University of Redlands where she graduated with honors. - from Leila aged 15. - from Ramses aged 16. Y.O.G.A. for Youth provided me with a fast, compassionate, emotionally sensitive and effective way to empower youth to find their own inner strength and guru. The program works in a variety of settings (schools, enrichment programs, social skills groups and one-on-one work. I highly recommend it for all levels of care providers and educators. Krishna Kaur's Y.O.G.A. for Youth training was an amazing experience for me. Upon completion, I felt as prepared as I could possibly be to teach young people. I feel totally supported by the Y.O.G.A. for Youth organization, and with all of the teaching materials, to go out there and teach! The practical training was very thorough and true to life, with wonderful feedback and compassionate yet direct critique. It attracted a very diverse and experienced group of people, whom I learned so much from. And more greatness, Krishna Kaur brought in other teachers from different areas of the country to share their experiences and train us. It's an honor to be a part of this awesome organization! Peace out, and in. Interested in Training for Teaching Youth, but have more questions? Please ask here and we will be happy to send you more information.